by Dennis M. Zogbi, Paumanok Publications Inc. Raw materials for MLCC, chip resistor and other mass produced components that are in short supply in 2019 are discussed in the next post published by TTI Market Eye. Passive electronic components are raw material intensive. Raw materials consumed in the production of mass-produced surface mount passive components usually come in the form of engineered powders and pastes. These powders and pastes make up the largest “variable cost” associated with the production of capacitors and resistors. This is why Paumanok Publications, Inc. has tracked the price and availability of specific ceramics and metals consumed as dielectrics and resistive elements for the past 30 years. The chart below shows the long-term trend in the costs to produce passive components, with the more recent trend in 2018 and 2019 of increasing costs to produce. Source: ©2019 The Passive Component Raw Material Index: Paumanok Publications, Inc. The above chart illustrates aggregate pricing for key feedstocks consumed as the primary dielectric material, resistive element, electrode or termination material for the production of passive electronic components (CRL). Raw materials are the most expensive variable cost associated with the production of passive components. Any fluctuation in price or availability for these key feedstocks can have a negative impact on profit margins. As Figure 1.0 illustrates, raw material prices for passive components are on the rise again in the March quarter of 2019 following a downward price trend in the later part of 2018 when the handset business unexpectedly slowed. Nickel is the primary electrode material consumed in high capacitance multilayered ceramic chip capacitors (MLCC). The fluctuations in nickel price are primarily the result of competition for the metal with the steel industry, where it is used as a hardener. Nickel supply is in turn important for the production of X5R, Y5V and X7R MLCC; which are the capacitors of choice for the operation of smartphones, tablets and TV sets. Copper engineered powders are consumed in the production of MLCC as well, but as the termination material consumed in conjunction with the nickel type electrode. Therefore, copper and nickel are an important type of base metal duo. Copper is used in some MLCC electrode systems because unlike its counterpart nickel it is non-magnetic. Etched anode and cathode foils are consumed as the dielectric layers of aluminum electrolytic capacitors the world over. Aluminum comes from bauxite, which is a mined material and whose price is easily calculated. Aluminum is abundant in the Earth’s crust and its price has been historically stable. Aluminum electrolytic capacitors are important components consumed in power supplies, television sets, computers and power electronics, including renewable energy systems. Zinc is used as an additive in ceramic chip capacitors and as the primary ingredient in the production of metal oxide varistors, which are consumed for circuit protection components in all known AC -line voltage equipment. Palladium is a platinum group metal that is mined in South Africa and Russia, among other locations. It’s consumed primarily for auto-catalysts, but also for jewelry and as the primary electrode material is precious metal based MLCC, which are in turn used in high reliability, high temperature and high voltage product markets globally. Historically, palladium has proven a difficult raw material partner for the MLCC supply chain because of its price volatility, which is compounded by it being a significant commodity metal subject to outside speculation on price. In the first quarter of 2019, the price of palladium is causing some difficulties because of its rapidly rising price. Ruthenium is a precious metal that is similar to that of palladium, but its primary purpose is to be consumed in all thick film chip resistors and resistor networks produced worldwide. The price of ruthenium has skyrocketed in 2018 and remains elevated in 2019 with its price up 275% year-on-year due to the shortage of thick film chip resistors in 2018—a problem which has begun to relax while ruthenium price remains high. The reader should remember that reliance on ruthenium for all mass produced thick film chips is a weakness that threatens the entire high-tech economy. The majority of tantalite metal used in the production of tantalum capacitors comes from Central Africa in 2019. Other known tantalite resources are located in Australia, Brazil and Canada. Tantalite’s primary use is as capacitor grade tantalum metal powder for consumption in capacitor anodes. Tantalum capacitors are consumed in communications networking equipment, smartphones, automotive, medical and defense electronics. 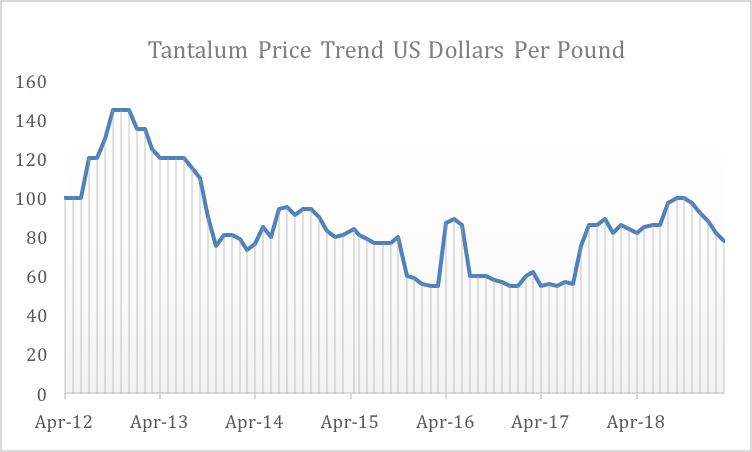 Tantalite and tantalum ores have demonstrated volatile pricing in the past, but has remained relatively stable in price during the current market shortages. The reader should know that the lessons learned from the tantalum supply chain have been and will continue to be valuable as OEM brands insist on transparency on all material supply chains. Silver is consumed as a termination material for many electronic components, but primarily for MLCC that employ precious metal electrodes. MLCC with precious metal electrodes and silver terminations are in turn consumed in high voltage, high temperature and high reliability MLCC for similar end-use market segments. Crude oil pricing is of interest because it sets the stage for so many other commodities, but is also included because in any wild swings in its supply would impact the plastics industry, which in turn would impact the film dielectric capacitor segment. Film capacitors are consumed in both DC and AC circuits and are primarily associated with power related equipment, lighting and home appliances. Base metal material prices have been behaving quite well, and do so because of their abundancy and their reliance on other industries outside of electronics for consumption. As OEM brands are asked to align themselves with specific case sizes and component configurations, they should also be asking their component manufacturers about their sourcing of raw materials. The reader should know that the steady aluminum price (Bauxite/alumina) bodes well for the production of thick film chip resistors that rely on mass-produced alumina substrates. Additionally, the steady nickel price since 2015 bodes well for MLCC manufacturers who consume it as electrode in high cap MLCC parts. 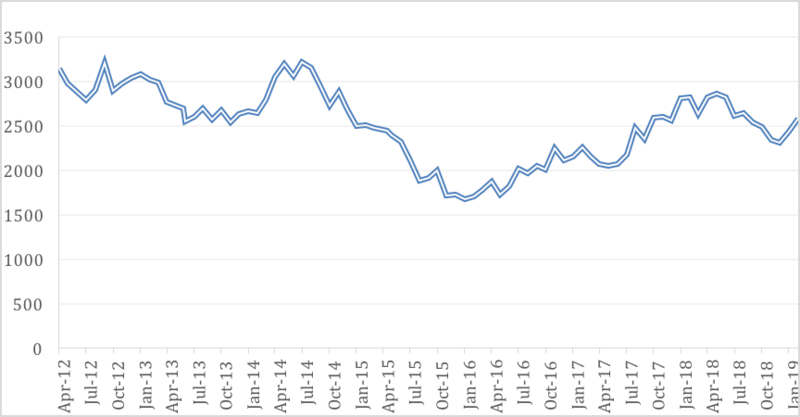 We can see that all of these prices are on the rise in the March quarter of 2019, although the reader should note that they are nowhere near their highs, which for nickel and copper happened back in 2014 (See Figure 2.0). Source: ©2019 The Passive Component Raw Material Index: Paumanok Publications, Inc. 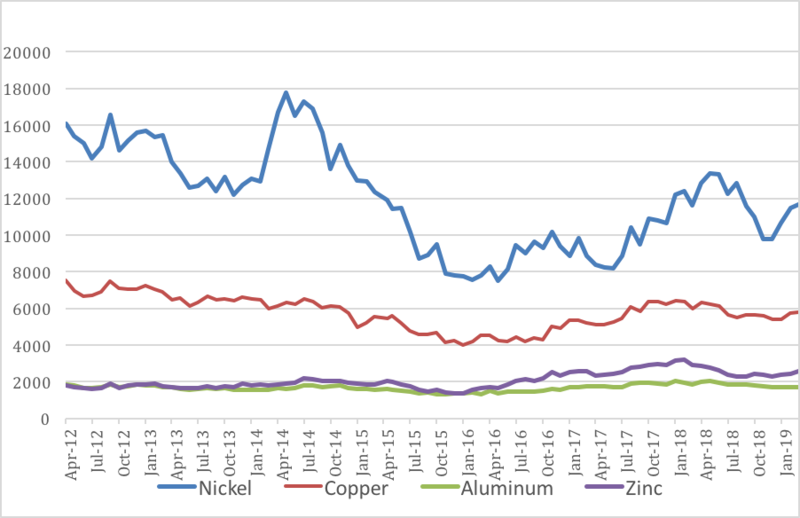 The above chart shows aggregate pricing in US Dollars for key feedstocks consumed as the base metal matrix- nickel, copper, aluminum and zinc, which in turn impacts the MLCC, aluminum capacitors and varistors markets respectively. 3.1 Nickel Pricing TrendNickel pricing fluctuates with the health of the Chinese economy; as it is primarily consumed in steel, and steel is in great demand in China. These price fluctuations from other external sources also impact the cost to produce high capacitance MLCC -where nickel is used as the electrode. 3.2 Copper Pricing TrendCopper has demonstrated less volatility when compared to its sister metal nickel; and in fact has shown slow but consecutive price reductions price from 2012 to 2015. Copper is used as the termination material in MLCC that have nickel electrodes. 3.3 Aluminum Price TrendThe aluminum price trend has been steady state. The pricing undulates and follows a pattern, but the pattern seems to be cosnistent and therefore easily planned for. Aluminum foil is consumed as the primary dielectric in aluminum electrolytic capacitors and this market is very sensitive to costs and price fluctuations. 3.4 Zinc Price TrendThe price trend for zinc is an excellent example of what can occur to a primary raw material as it can be affected by supply and demand imbalances. In the instances of zinc and just recently, the amount of available zinc above ground was a matter of speculation which caused the price to rise. Zinc is used as an additive in ceramic capacitors and as the primary material in zinc oxide varistors. 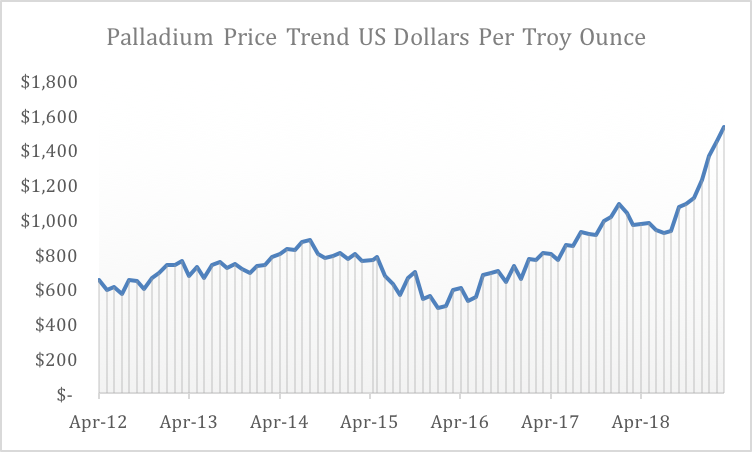 4.1 Palladium Price TrendThe price of palladium has been skyrocketing in the March 2019 quarter. Palladium is consumed in MLCC electrodes for specialty electronics applications in high voltage, high frequency and high temperature MLCC; this is where the shortage of parts is most prevalent. The rising palladium price is due to financial speculation, coupled with increases in real demand from the auto catalyst industry. 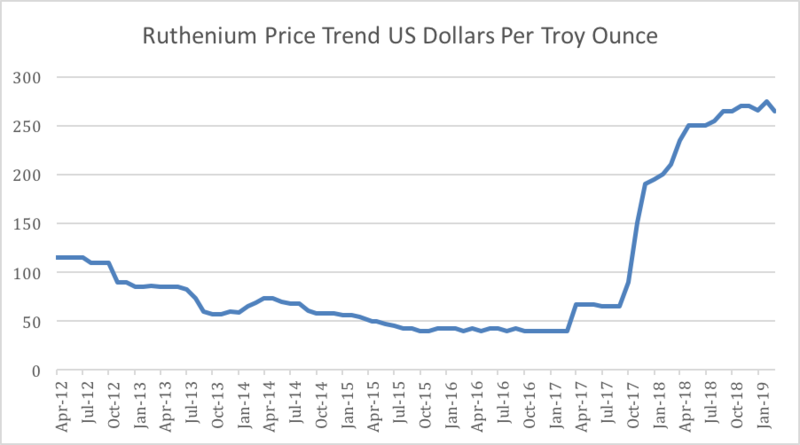 4.2 Ruthenium Price TrendThe ruthenium price has increased by 275% since 2017 and has not come back down as of yet. The high cost is having a direct influence on the price of resistors and their costs to produce. 4.3 Tantalum Price TrendIn the past, tantalum has been a difficult material due to its “conflict mineral” status established by the United Nations. However, through concerted efforts of the supply chain, we see the market for tantalum ore relatively stable compared to other materials. In the past the tantalum ore price would have reacted differently to the shortage of components. Most of the materials consumed in the production of passive electronic components demonstrate limited price fluctuation; however, a few materials have demonstrated such volatility that they need more study. These include ruthenium, palladium, and tantalum in March 2019. 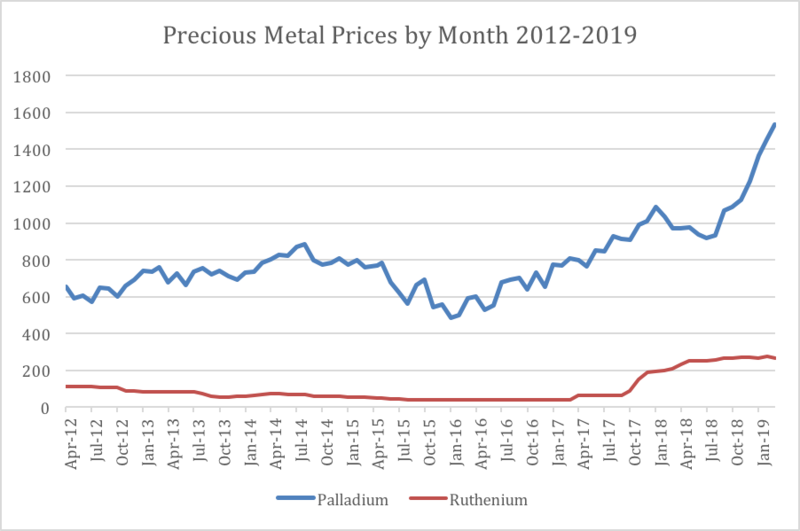 The Ruthenium PriceThe price of ruthenium has increased by more than 275% during the shortage of parts in FY2019. Ruthenium is the key ingredient in the resistive paste consumed in thick film resistor chips as well as dual-in-line and single-in-line network packages. The component markets that consume this precious metal are all in turmoil and the metal is reacting to its supply and demand imbalance. Primary sources should understand that the cost to produce resistors will be very high as long as a primary ingredient costs so much to procure (See Figure 4.0). The Palladium PriceThe price of palladium and its traditional volatility has been a reason why the development of alternative nickel electrodes took place back in 1993. However, there are still many vendors who consume palladium bearing electrodes in their production of MLCC. Those vendors are usually specialty MLCC vendors in high temperature, high frequency, or high voltage MLCC channels, that have air fired systems and solid state ceramic materials processes (See Figure 5.0). As previously described, tantalum, is a key dielectric material consumed in capacitors for decades. Its price has been the subject of past problems in the supply chain. However, due to concerted efforts by the industry, the price has been comparatively stable (See Figure 6.0). The Passive Component Raw Material Index has shown that costs to produce passive electronic components, especially certain types of capacitors and resistors, with emphasis on MLCC and thick film chip resistors, have increased between FY2017 and FY2019. Specific materials, such as ruthenium and palladium continue to demonstrate volatility and are expected to have a continuous impact on the costs to produce for specialty MLCC and thick film chip resistors in 2019.